Join West Coast Youth Community, Mentally Fit EP and Mana Wellbeing Centre for a three day holiday program of free events for the community from the 26th-28th of April for SALT Festival. 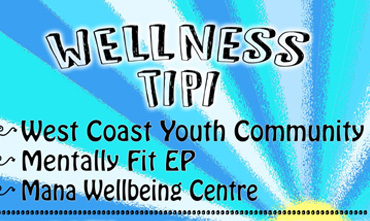 Some of the free activities available in the Wellness Tipi include yoga & meditation, drumming cricles, drama and writing workshops, cooking events, dance and music. This will all take place over three days: Wellbeing Wednesday, Thankful Thursday and Friday Funday! The Wellness Tipi is an amazing example of what is possible when a community comes together – and all are welcome to come and enjoy this space!